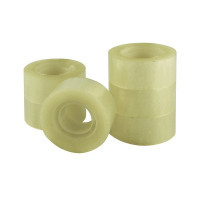 This strong polypropylene adhesive tape seals fast and holds tight, ideal for packing, wrapping and sealing. Suitable for home and office use, each roll of tape measures 24mm x 33m. This pack contains 6 clear rolls.